Known as the "Rock of Gibraltar" for his steadfast play in the middle of the defensive line, Tom Brown has often been credited with leading the resurgence of the Minnesota football program. Finishing last in the BIG TEN in 1959, Brown spearheaded a dramatic turnaround that saw the Golden Gophers win a national championship and a trip to the Rose Bowl in 1960. 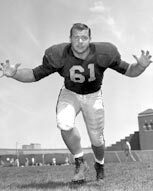 A fierce hitter, Brown took home a trophy case full of awards and honors in 1960, which included unanimous All-America recognition, the Outland Trophy, BIG TEN Conference MVP honors and the Bronko Nagurski Award given to the Golden Gopher's MVP. He also finished second in the Heisman Trophy voting in 1960 - only the third lineman to finish second or better in the history of the award at the time. A First Team All-Conference pick, Brown played in the Coaches All-America All-Star Game and the Hula Bowl in 1961. Following his legendary collegiate career, Brown played professionally for the British Columbia Lions of the Canadian Football League. In 1964, the Lions won the Grey Cup, and Brown was named the eam's MVP. The former owner of a health and fitness store, Brown currently resides in Bellingham, Washington.